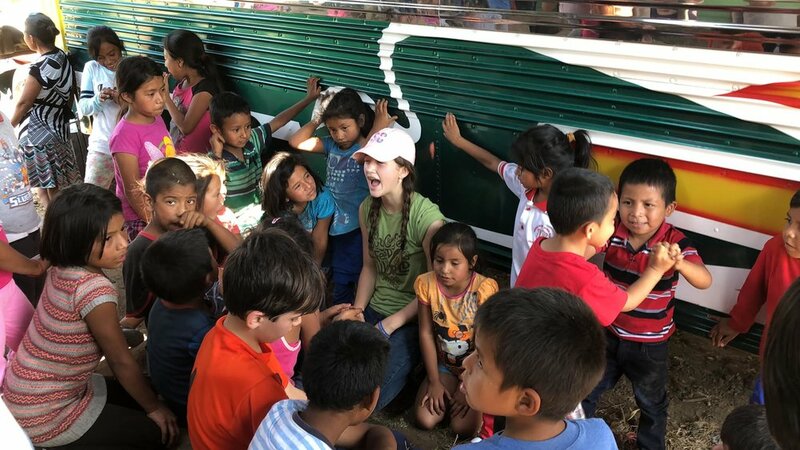 Last week, I went to Guatemala for the sixth time in three years. My family and I went to an orphanage called Casa Bernabe with a team from our church. We stayed for a week, doing various projects, like feedings, building houses, and digging trenches, and just playing with the kids. For the first few days, I worked in Casa de los Angelitos, helping out with the babies. I would spend six hours there, from eight to one, helping feed the babies, change diapers and playing with them. There are nine kids under the age of 7, of which 2 have special needs. I really enjoyed being able to love on the kids and the people who give up their lives to be there for these kids, even if it meant changing a diaper or two. I’ve discovered that there’s a special place in my heart for these kids who have been beaten down by the world. No one deserves to feel that kind of pain, especially babies. You wouldn’t know it by looking at these babies though. The house parents are like their biological parents, and the kids love them like they are. They are surrounded by love and routine. It is incredible to watch and be a part of. Every morning, at 6 am, we had devotions around the picnic table. We watched the sunrise and studied Colossians. I tried to make it the first few days, but failed because I didn’t get up in time. But the few days I did make, were powerful. The majority of the team, diving into the Word together, giving insights, voicing questions, and growing in unity. Hearing the different versions of the Bible, read together, giving different perspectives, is an extraordinary experience. On Thursday, our team went to the village of Jocotillo, where we had a medical clinic, distributed food, and built a house. I helped out in the clinic, acting as a pharmacist, making Ziploc bags of acetaminophen, and writing out the dosage instructions, in Spanish, on the bags. I did that for a while, then, since the kids were trying to get into the clinic, even though they didn’t need to see the doctor, I entertained the kids by teaching them English. I would say a word in Spanish, then repeat it in English and have the kids say it in English. I had a very large group, maybe 15-20 kids. Then we played duck, duck, goose in Spanish (pato, pato, ganso), and had a group of probably 30, maybe 35, kids. The kids loved it, and when, after probably 2 hours, I got up to go help with the feeding, several kids followed me and asked for me to keep playing. I told them I would come play later and went to help with the feeding. One little boy followed me, and I ended up giving him a piggyback ride for almost 2 hours. He was absolutely adorable! When we first arrived in Guatemala, we went to Pollo Campero to eat lunch. We had a large group, 17 members, and filled up the lobby. I translated for the group, which was awesome! I actually understood the waitress and was able to communicate to her what we wanted. And during the trip, I could feel my Spanish growing. I could talk more Spanish, and understand more as well. And, once, at the Jocotillo clinic, I was able to translate a little for Melanie when Julia needed a break. Then, on the plane back, there was a family who didn’t speak any English, and it was their first time flying. I was able to help a little with getting them to their seats and settled in. I love being able to help people, to communicate to them in the language they understand best. It gives me a feeling of satisfaction, of fulfillment. I love understanding more and more, having more knowledge. Going to Guatemala takes a lot out of you. Not only emotionally, your heart emptying of the world’s desires, and filling up with love, but also physically, with you waking up at 4 am every morning and going to bed at 11 after working all day. When our plane landed in Charlotte, it was midnight. We got home at 1 am and I didn’t go to sleep until 1:30 in the morning. Then I had to wake up at 6:45 to go to a volleyball tournament and play from 8 to 3. Then I went to youth group until 9pm. Needless to say, I was EXHAUSTED. I feel into bed at 9 and didn’t wake up for 18 hours, sleeping until 3:30. One of my many blessings is being homeschooled and not needing to wake up for school. If I need rest, I can rest as long as I get all my work done. I love Guatemala and the stirrings it creates in my heart. I could move there at some point in my life, but for now, I’m here. I’ve learned to bloom where I’m planted, and for now that’s here, in Lake Wylie. I look forward to seeing what God will do in me and how He will move in this coming year. Ellie being warmly greeted by friends the first day back to Casa Bernabe. They were so happy to see her visit again. Two of the cuties from the Baby House where Ellie loves to serve.